The source code for this post has been updated to the latest ASP.NET Core version (.NET Core SDK 1.0 project – can be opened using VS 2017) and angular 4 as well (Repository). Real-time web applications are apps that push user experience to the limits while trying to immediately reflect data changes to a great number of connected clients. You make use of such applications on a daily basis, Facebook and Twitter are some of them. There are several ways to design and implement Real-time web applications and of course Microsoft made sure to provide you with a remarkable library named SignalR. The idea behind SignalR is let the server push changes automatically to connected clients instead of having each client polling the server on time intervals. And what does connected clients means anyway? The answer is hidden behind the concept of the HTTP persistent connections which are connections that may remain opened for a long time, in contrast with the tradional HTTP Connections that can be disconnected. The persistent connection remains opened due to certain type of packet exchanging between a client and the server. When a client calls a SignalR method on the server, the server is able to uniquely identify the connection ID of the caller. Have fun with the final App! The app simulates a web application that users may visit and watch matches live. I am sure you are aware of plenty of such websites, most of them are related to betting. The idea is that there will be two matches running, and every time score is updated all connected clients will receive the update. On the other hand, if a user also wants to getting live feed for a specific match then he/she has to be subscibed to the match. More over, if subscribed, the user will be able to post messages related to that match while those messages will be pushed and read only by users also subscribed to the that match. Why don’t we take a look at the LiveGameFeed app (zoom out a little bit if needed so that you can see both clients).. 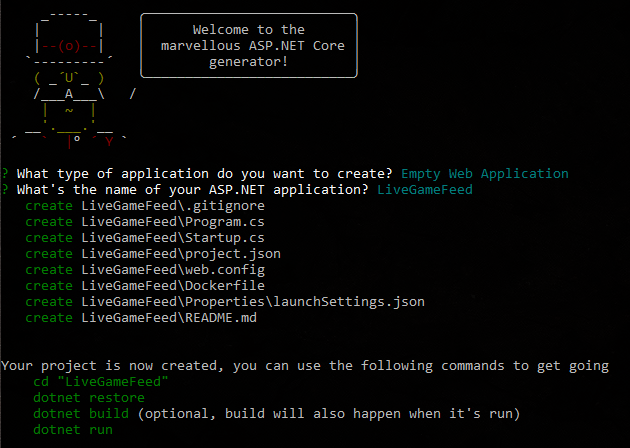 I assume you have already installed .NET Core on your platform and you have opened the Live-Game-Feed app on your favorite text editor. 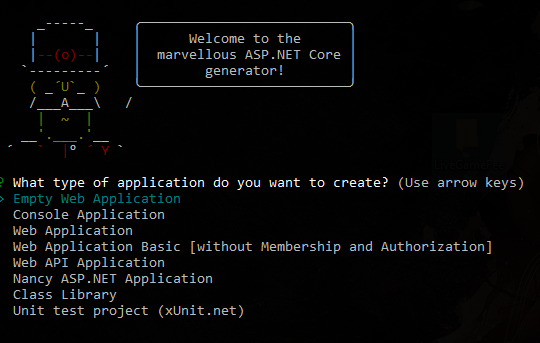 You can start a .NET Core application either using the dotnet-new cli command or using the open-source yeoman tool. I picked the latter choise cause there are some great options to fire up a ASP.NET Core application. In order to use yeoman you need to run the following commands. The tool will give you some options to start with. Select Empty Web Application and give a name for your app. Open the created folder in your editor (mine is Visual Studio Code) and check the files created. Those are the minimum files required for an empty Web Application. Navigate inside the app’s root folder and restore .NET packages by running the following command. 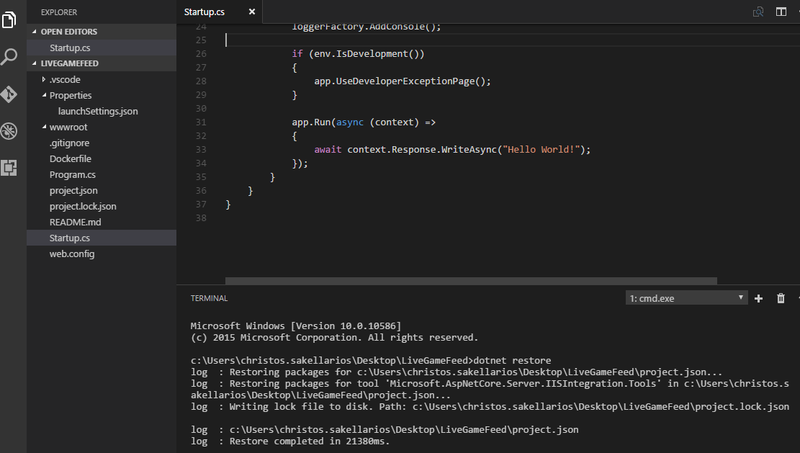 As you can see, Visual Studio Code has also an integrated terminal which certainly makes your life easier. Then make sure that all have been set properly by running the app..
Of course you will only get the famous Hello world! response but it’s more than enough at the moment. If you try to restore the packages you will get the following error..
error: Unable to resolve 'Microsoft.AspNetCore.SignalR.Server (>= 0.2.0)' for '.NETCoreApp,Version=v1.0'. error: Unable to resolve 'Microsoft.AspNetCore.StaticFiles (>= 1.1.0)' for '.NETCoreApp,Version=v1.0'. error: Unable to resolve 'Microsoft.AspNetCore.WebSockets (>= 0.2.0)' for '.NETCoreApp,Version=v1.0'. log  : Restore failed in 10232ms. Unable to resolve 'Microsoft.AspNetCore.SignalR.Server (>= 0.2.0)' for '.NETCoreApp,Version=v1.0'. Unable to resolve 'Microsoft.AspNetCore.StaticFiles (>= 1.1.0)' for '.NETCoreApp,Version=v1.0'. Unable to resolve 'Microsoft.AspNetCore.WebSockets (>= 0.2.0)' for '.NETCoreApp,Version=v1.0'. Now the dotnet restore command will not fail. You add MVC and SignalR into the pipeline in the same way you add any other middleware. In the Startup.cs file you will find the following commands into the ConfigureServices method..
.. and in the Configure method..
You will find that in the finished Startup.cs file I have also set dependency injection for the data repositories, Entity Framework InMemoryDatabase provider and some recurrent tasks to run using the RecurrentTasks package. We ‘ll talk about the latter little bit before firing the final app. Next you need to add the required typings by adding a typings.json file. The tsconfig.json TypeScript configuration file. At this point you can run the npm install command to install all the NPM packages and typings as well. A Hub is nothing but a C# class derived from the Microsoft.AspNetCore.SignalR.Hub. The idea is that clients may connect to a certain Hub and hence it’s logic that this class would implement methods such as OnConnected or OnDisconnected. Let’s view the abstract class in more detail. A Hub can implement methods that the client may call and vice versa, the SignalR client may implement methods that the Hub may invoke. That’s the power of SignalR. Our app has a simple Hub named Broadcaster under the Hubs folder. Let’s discuss the above class in detail. The Clients property holds references to all connected clients. Before invoking a client method, you can target specific clients. On the above example we targeted only the caller using the Client(Context.ConnectionId). There are other options though as you can see. SignalR lets you group clients using the Group property. Broadcaster Hub, has two server methods that clients may call in order to subscribe/unsubscribe to/from certain chat groups. 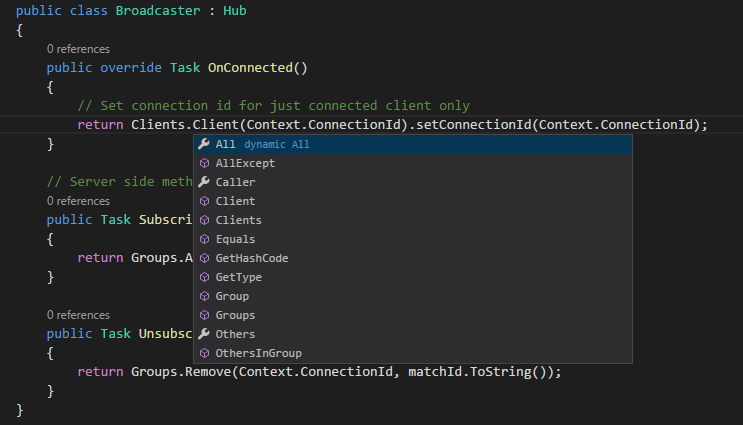 In SignalR, all you have to do is add/remove the respective client connection id to/from the respective group. Here we set that the group name is equal to the matchId that the client wants to listen messages for. Later on, when the server needs to send a message to a certain group, all it takes to do is the following..
What the previous line of code does, is invoke the addChatMessage(message) client-side method only to those clients that have been subscribed to the group named message.MatchId.ToString(). Subscribe and Unsubscribe are the only methods that our hub implements and can be called from the client. The client though will implement much more methods and most of them will be invoked through the MVC Controllers. As you noticed, in order to call a client-side method you need reference to the IHubCallerConnectionContext Clients property but for this, we need to integrate MVC with SignalR. We have also used an interface so we have typed support for calling client side methods. You can omit this behavior and simply derive the class from Hub. This is the most important part of the post, making Hubs functionality available to MVC Controllers. The reason why this is that much important is based on the web application architectural patterns where clients usual make HTTP calls to REST APIs, with the only difference this time the API is also responsible to send notifications to a batch of other connected clients as well. For example, in the context of a chat conversation, if a user posts a new message to a MessagesController API Controller and that message needs to be delived to all participants, the API Controller should be able to immediately push and deliver the message to all of them. The image denotes that SignalR server can communicate with SignalR clients either via a direct “channel” between the Hub and the client or through an integrated MVC Controller which does nothing but access and use Hub’s properties. To achieve our goal, we ‘ll make any MVC Controller that we want to use SignalR derived from the following abstract ApiHubController class. You will find that class inside the Controllers folder. Getting the instance of the Microsoft.AspNetCore.SignalR.IHubContext will give us access to both the Clients and the Groups properties. Let us view the interface in detail.. The where T : Hub means that you can create as many Hub classes as you want and make them available to any MVC Controller on demand. Now let’s see an example where we actually use this class. LiveGameFeed app has a MatchesController MVC Controller which basically is used for two reasons. First for retrieving available matches that our app serves and second, when score is updated on a match, pushes the change to all connected clients. We get an instance of IHubContext for the Broadcaster Hub.. When a match score is updated we want to notifify all connected clients, regardless if they are subscribed or not to the related feed. The client is going to implement an updateMatch function that can be called from the Hub. In a similar way you will find a FeedsController MVC Controller where when a new Feed is added to a match, the API notifies those clients that not only are connected but also subscribed to that match feed. Since we want to target only the clients subscribed to the group named equal to the matchId, we use the Group property as follow. The code references a hub named Broadcaster and defines a client side method on the broadcaster.client object. Notice the lowercase .broadcaster declaration that connects to a Hub class named Broadcaster. You can customize both the custom Hub name and the path where the server will render the proxy library. We need though to switch to TypeScript so let’s define interfaces for the SignalR related objects. You will find them in the interfaces.ts file. The SignalR interface is defined in the typings/globals/signalr/index.d.ts and we installed it via typings. The FeedProxy will contain references to the client and server hub connection objects respectively. Any client side method that we want to be invoked from the server be implemented on the client object and any server side method implemented on the server (e.g. Subscribe, Unsubscribe) will be called through the server object. The FeedClient is where you define any client side method you are going to implement and the FeedServer contains the server methods you are going to invoke. Again the methods are in lowercase and matches the uppercase relative method on the server. If you don’t use this convetion you will not be able to call the server methods. The feed.service.ts file is an @Injectable angular service where we implement our interfaces. The pattern is simple and we will examine the case of the addChatMessageSubject client side method. First you define an Observable property of type ChatMessage cause when called from the server, it will accept a parameter of type ChatMessage. .. the ChatMessage looks like that and of course there is a relative server ViewModel on the server. Then you define rxjs/Subject property for that method. The next step is to define a method (or event if you prefer) where you respond to the observable events. There is a last step where you actually bind this method on the client property of the hubs connection but first we need to configure our proxy. This is done on the start method as follow.. But remember.. in the LiveGameFeed app, this method will be called only on those clients that are subscribed on the relative match. This is defined on the MessagesController MVC Controller, when a chat message is posted. The methods that can be called on the server are way much easier to implement since are just methods defined on the connection.server object. You may have noticed that in the project.json there is a RecurrentTasks package reference. I used that package in order to simulate live updates and make easier for you to see SignalR in action. In the Core folder you will find a FeedEngine class that triggers updates on specific time intervals. There are two type of updates. A match score update which will be pushed to all connected clients though the MatchesController MVC Controller and feed updates being pushed through th FeedsController. In the Startup class you will also find how we configure this IRunnable task class to be triggered on time intervals. I guess you have already downloaded or cloned the repository related to this post as I mentioned on start. In order to fire the app you need to run the following commands (open two terminals and navigate to the project) The first three will download NPM and Bower packages and compile the angular app. Also it will be watching for TypeScript changes during development..
and the .NET Core related that will restore the packages and run the server. Open as many browser tabs or windows as you wish and start playing with the app. Every 15 seconds the app will trigger updates and all clients will receive at least the score update. If subscribed, they will receive the feed and any messages related to the match as well. Mind that two tabs on the same window browser are two different clients for SignalR which means have a different Connection Id. The connection id for each client is displayed on the chat component. On new feed received event, the new row to be displayed is highlighted for a while. Here is the angular directive responsible for this functionality. SignalR library is awesome but you need to make sure that this is the right choice to make before using it. In case you have multiple clients that is important to push them updates on real time then you are good to go. That’s it, we finally finished! 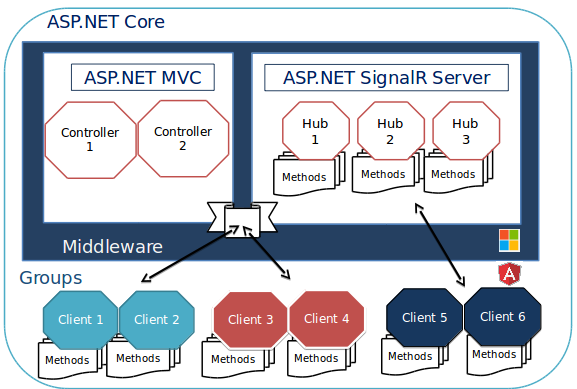 We have seen how to setup an ASP.NET Core project that leverages SignalR library through MVC Controllers. More over we used SignalR typings in order to create and use the SignalR client library using Angular and TypeScript. Source Code: You can find the source code for this project here where you will also find instructions on how to run the application. Awesome post Chris, thanks! And congrats on your MVP Award! Chris you repeated the content of typings.json on tsconfig.json, it’s correct on Github but is not on this post. Thanks Eric, I fixed it on the post as well. FANTASTIC blog post. Christos. Thanks so much. Not working on Ubuntu though – running into this issue. I am aware of the issue cause I run Ubuntu 16 on my laptop. I am waiting for a decent resolution as well. As soon as it comes up I ‘ll make sure to commit the changes on the repo. Great Post, but have a problem finding Microsoft.AspNetCore.SignalR Nuget package? The only one that appears is Gray.Microsoft.AspNetCore.SignalR. Am I missing something? This package is not actually available at the moment and this is why we had to add a NuGet.config file. If you remove this file, you won’t be able to restore that package. error: Unable to load the service index for source https://dotnet.myget.org/F/aspnetcore-ci-dev/api/v3/index.json. error: An error occurred while sending the request. And this is not a matter with connection. I even tried using wifi from my mobile (no proxies). I can access this URL on my computer. Try to clone the repository and follow the exact instructions. I have just tested it and works fine. You alway use systemjs , how about WEBPACK, how using it in this post ….please , THANKS..!! In your interface.ts you haven’t imported module for SignalR. Typescript will not compile without this. Do you specify the path to the typings file? It compiles because SignalR typings are installed as globalDependencies. Same applies for jQuery. These are globals that exist at runtime, you do not “require” them. This is about compile time. As far as runtime, there are references in the Index.cshtml page for those libraries. Note that the /signalr/js is actually created by the server automatically. Nice Post !! I was able to compile and build, when running it’s only showing empty page with no Live Feed loaded. How can I connect the hub from pure angular client (no cshtml)? I wish you had it done inside a MVC Core project. VS Code is such a pain for us. Everything is different inside VS Code. Does signal R require jquery on the client? Can I follow the tutorial with Visual Studio 2015? I migrated the project to .NET Core SDK 1.0 project so I guess you can (there is aspnet-core-signalr-angular.csproj file to open..). I have tested it in VS 2017 and works perfect. I also updated angular to angular 4. View source-code. You are great. Thanx for the timely reply. Learners like myself can be very nagging. I was able to install the SignalR and Websocket packages on .Net Core 1.1 but something very weird is happening. If I build the project it compiles, but if I rebuild it, the signalr package disappears, I get errors, and I have to do dotnet restore again. Hi Chris awesome post. Kudos!! I was able to build and run the application locally, however I tried to deploy to an azure web site and received a 503 error «WebSocket connection failed: Error during WebSocket handshake: Unexpected response code: 503». I tried to deploy application as is. IE did not change anything. Am I missing a step? Once again thanks for the wonderful tutorial. Any help is greatly appreciated!! Using this as a proof of concept with Signalr and .net core. btw another great post!!! I now have Chat portion working properly, but the scores are not updating. Any help is greatly appreciated. What can you do to ensure that the siganlr still works after an app pool recycle occurs? you can’t, unless you can ensure IP and port consistency after recycle, but all your clients have ‘lost’ the connection, so you’d need to get each of them to “retry” and long poll until the app pool is back up.